Chef’s Vision 6 Piece Color Landscape Kitchen Knives Set comes in a luxury gift box and is razor sharp with a unique non-stick design. You get an 8-inch Chef knife has summer in the mixed forest of Beckingen Germany, 8-inch Bread knife has gone over the Carpathian Mountains in Western Ukraine, 8-inch Slicing Knife has tulip fields in the province of Flevoland Holland 7-inch Santoku Knife has on him Beech forest over the Carpathian Mountains in Western Ukraine, 5-inch Utility Knife has sunset over the sea on the beach of Con Dao in Vietnam.And 3.5-inch Paring Knife views from Lake Tekapo on the South Island of New Zealand. 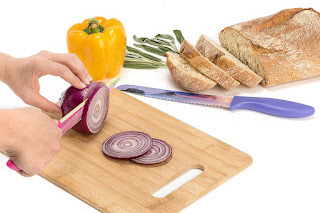 These are made with high-quality stainless steel blades for precision cutting, superior nonstick multi-color code in helps to release in slices and sticky food after slicing. These have an ergonomic handle so you can assure to have a stronger grip and smooth cut in action. Dishwasher safe making it easy and hygienic to clean along with color coding to help prevent food cross-contamination. Approved by several food safety agencies including the FDA in America, LFGB in Germany, SGS in Switzerland, EEC and Europe and DGCCRF in France. These have a 100% money back guarantee so if you don’t like them you can reef turn them and get refunded. My Opinion: I really was drawn to the beautiful scenic Chef’s Vision knives as I really like the landscape that was on each knife I’ve never seen anything like them. I also got to thinking if I was a chef how these would be nice to look at instead of plain knives. I did find these to work very well for whatever I needed to cut with them in the box they come in is beautiful to keep him in place, I had no problems using them in the dishwasher and they came out perfectly fine.